Good Morning Delmarva, Juicing, Popovers, Gluten Free, It’s Sunday!! I am trying to stay ahead of the flu. Believe me, I have been overexposed. Some have it in my household…I got the flu shot, vitamins, and tons of liquids since I decided to start juicing. Getting those nutrients directly from fruits and vegetables. I hope it works. I shopped for the juicer at some of our stores in Rehoboth Beach. 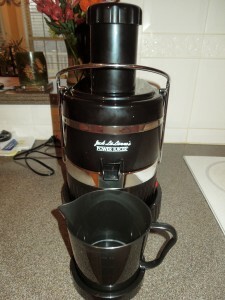 I decided on Jack LaLanne’s Power Juicer. First of all it is a proven juicer. Secondly, the price was $99. There were some that were $49 but I did not know how they would hold. And, then, there were the ones that were $200 and up. I am a novice at this. The third attraction to this juicer was easy clean-up. Juicing is expensive, no two ways about it. I usually buy fresh but when you are juicing you need to buy in larger quantities. I have beets, turnips, celery, oranges, melons, greens…I got avocados and bananas. Please note that the juicer is strictly a juicer. 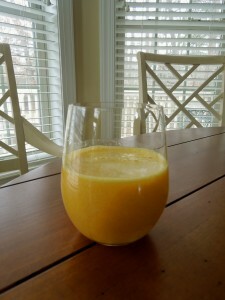 No smoothies; avocados and bananas do not have liquid, therefore blend those in a blender or food processor and then add to the already made juice. 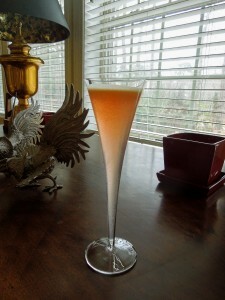 I love Gala apples so this was one of my first juices. Freshly squeeze orange juice is always a treat. Juiced with the rind so as to absorb all vitamins. 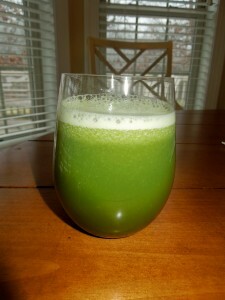 Look at the color of the celery juice. Celery is full of vitamins and low in fat. It is also a natural diuretic. Something new I learned is that some people are allergic to celery. In Europe they disclose if products contain celery. I decided to make popovers. I have not been too successful at them. It could be the gluten free flour used. I am getting better. I want them to be light but they still come out more muffin-like. They were delicious, don’t get me wrong. 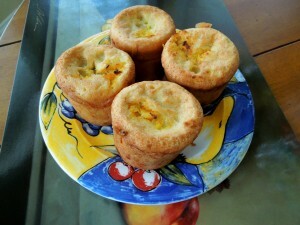 I used the pulp collected in the pulp collector to give my popovers added flavor. Before I post the recipe, let me tell you that I used an interesting gluten free flour. 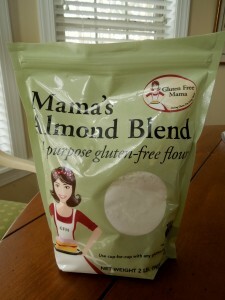 Mama’s Almond Blend. It has white rice flour, tapioca flour, potato starch, sweet rice flour and almond meal flour. It is a light flour; non gritty. To learn more visit http://www.glutenfreemama.com. I also used a 100% Coconut sugar. It is, apparently, the “in” sugar to use. I, actually, won it at Good Earth Market & Organic Farm, located in Clarksville, Delaware. 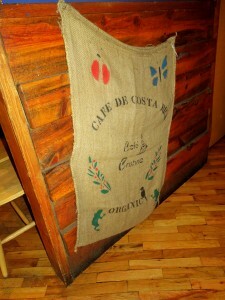 http://www.goodearthmarket.com. It is organically grown and more nutritious. It smells like coconut, but it does not taste like it. The taste is more like raw sugar with a hint of caramel. 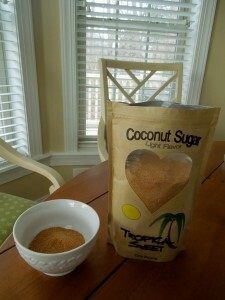 Diabetics, please listen, because coconut sugar ha a low glycemic index, it is better for you. In a large bowl whisk the eggs with sugar and zest. Whisk in milk and 3 tablespoons of melted butter. In another bowl whisk the flour with the baking powder and salt. Whisk the wet ingredients into the dry ingredients until small lumps only remain. 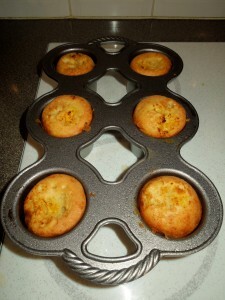 Melt the remaining tablespoon of butter and brush the inside of the popover or deep muffin pan. Place the empty pan in the oven for about 10 minutes. Don’t worry if the butter starts browning. Take it out and then, carefully, fill them half way. 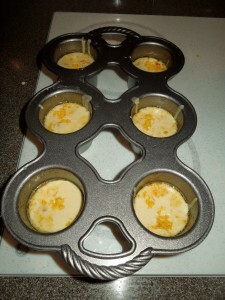 You can sprinkle some of the rind or pulp on top just before putting them in the oven. Nice and hot, ready to eat. Great with honey. 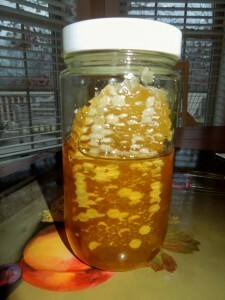 I added to my raw honey some freshly squeeze orange juice and rind. 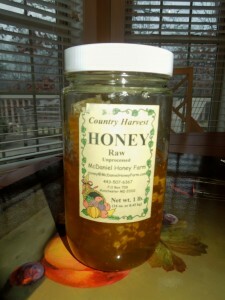 The Country Harvest raw honey came from Manchester, Maryland. Dip or spread. Visiting Denver at the end of the summer was great. The weather was perfect and the City was so clean and accessible. Denver Convention Center – If you are visiting from the East Coast, you know how much we like boats, the water and all those water sports. 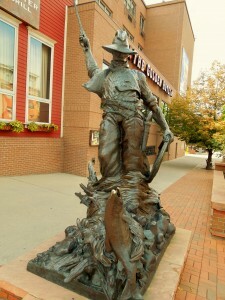 Well, the Premier Boat show in the Rocky Mountain Region is at the Denver Convention Center until Sunday 1/13. 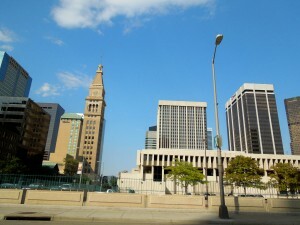 The Convention Center was opened in 1990 and it is within walking distance to hotels, art museums, shops and restaurants. 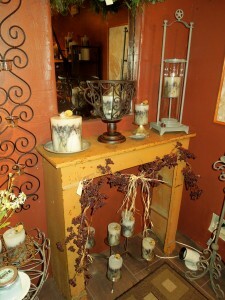 It is so easy to find, located at 700 14th St. But, if you see the Big Blue Bear, then, you know you have reached your destination. 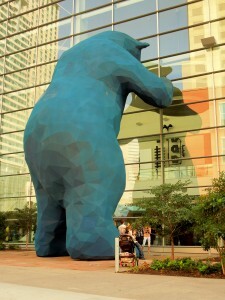 This Big Blue Bear is peering inside the Denver Convention Center; almost like wanting to see what’s going on. It is 40 feet tall….”I See What You Mean”…More info? 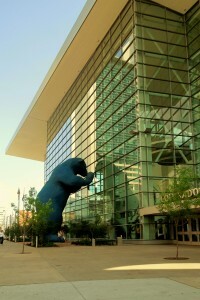 Please visit http://www.denverconventioncenter.com. 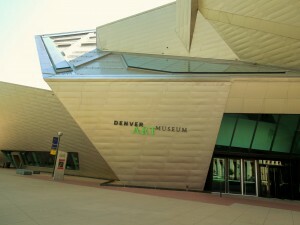 Denver Art Museum – The Museum is also in Downtown Denver, located at 100 W 14th St. It is a very friendly museum. 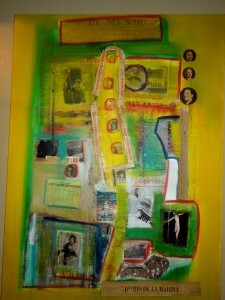 There are so many exhibits taking place at the present time….and some very exciting ones coming up. Until Sunday, 1/13: Dana Schutz: If The Face Had Wheels. Becoming Van Gogh until 1/20. More info? 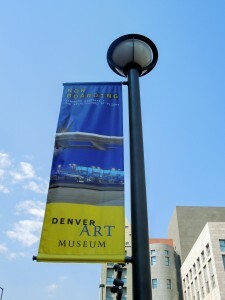 Please check http://www.denverartmuseum.org. 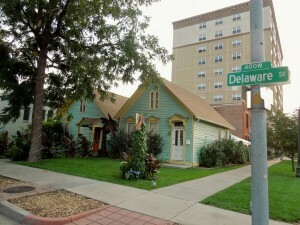 Looking for some Latin cuisine in Denver? Cuba Cuba has been hailed as one of the best, if not the best. 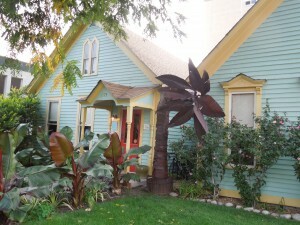 It is located at 1173 Delaware St. Tel. 303-605-2822. Website? 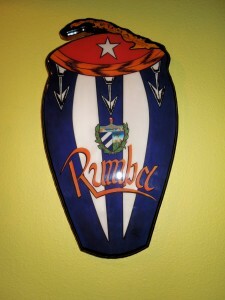 http://www.cubacubacafe.com. Cuba Cuba opened its doors in 2001. 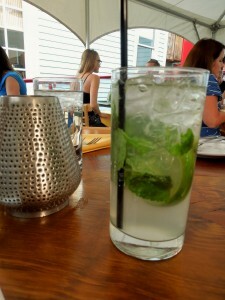 Mojito Happy Hour is Monday through Thursday from 5 p.m. until 6:15 p.m. And, I do have to say that they offer gluten free options for those with gluten allergies and sensitivities. 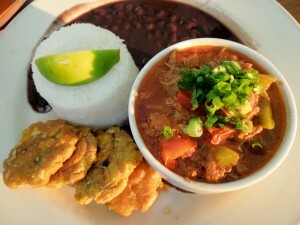 So, if you are longing for some Mariquitas, Fried Yuca, and Ropa Vieja….then, by all means stop by. This post is for all of you that might be heading out west for a little skiing. It is that time of the year!! 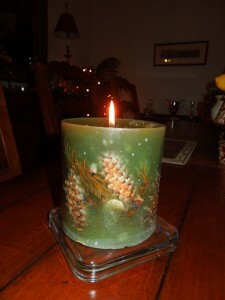 I have finally started to enjoy my Botanical Pillar Candle. I chose the French Pine. The other day when it was cold and rainy, here at the Delaware Beaches….a little bit of Golden, Colorado, was very well received. 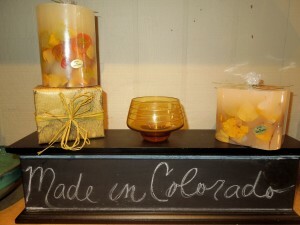 I bought this candle a few months ago when visiting my friend who lives on Lookout Mountain, outside of Denver. Marisa took Cindi and I to all of her favorite stomping grounds. Nature’s Gift was one of them. I have gotten into candles this past year. I love the ones with true scents. This company delivers just that. 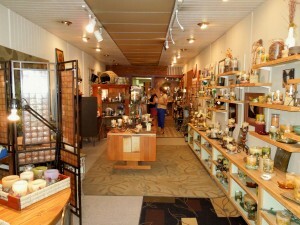 Nature’s Gift is located at 1208 Washington Avenue, Golden, CO 80401. Tel. 303-278-1690. Website? 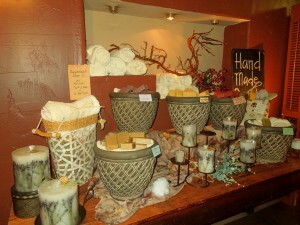 http://www.naturesgiftcandles.com. The store was full of candles. 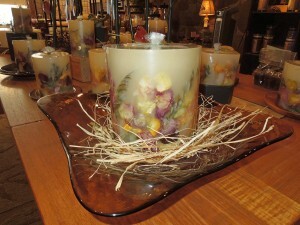 All through the store, you will be viewing beautiful botanical garden candles which have been inspired by the Rockies. They are hand poured, then the real fruit is added, along with flowers and other botanicals to the outermost layer of wax. 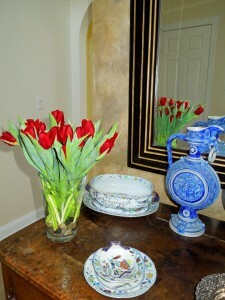 Each is an original and I can attest that the scent is distinct, yet subtle, permeating through your home. 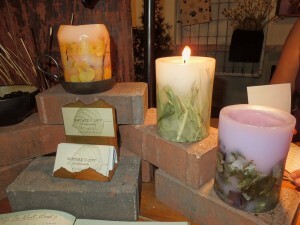 The candles can be purchased through the website. 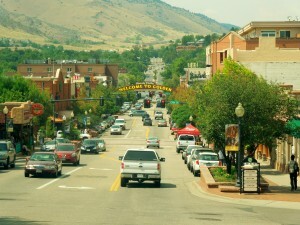 But, if you happen to be going out west, the Historic Town of Golden is not far away from Denver. 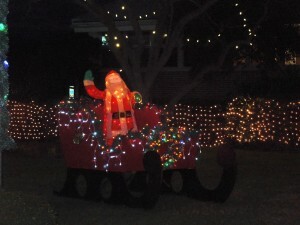 It is located in Jefferson County. The town is small with gorgeous landscapes. 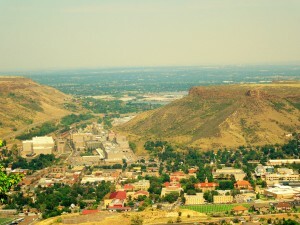 The Colorado School of Mines is located in Golden. 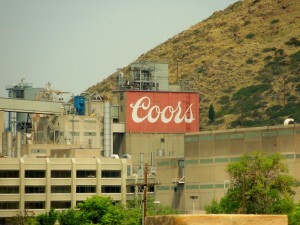 And, also Coors makes Golden its home. 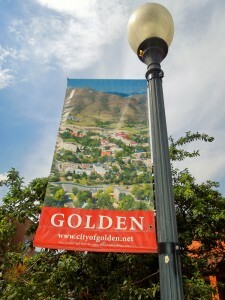 Walking through Golden reminded me of our own towns in Southern Delaware. 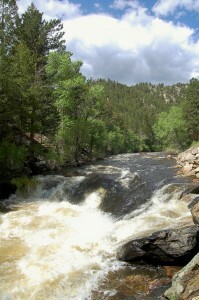 The town is being preserved, the river is enjoyed by so many. It is worth stopping by. If you are arriving this week-end, then, check out Golden’s First Fridays where you will find specials, entertainment, free horse-drawn carriage rides, and artists’ signings. Check the new shops or enjoy your favorites. 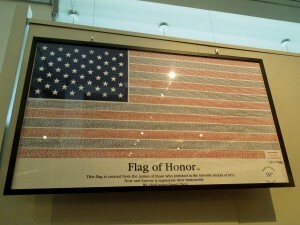 This Flag of Honor was created from the name of those who perished in the terrorist attacks of 9/11. Now and forever it represents their immortality. Today we get to vote. Citizens over 18 years of age are able to cast a vote. We take this vote for granted. But, don’t do that so quickly. It took years to get to this point. Our right to vote in this country defines our Nation as a Democracy. I have been told…well, our vote does not make a difference. So many people in other countries are fighting and dying for the right to vote and to an election. Don’t underestimate the power of your vote. Four years ago, I was not able to vote on that election. After telling everyone to vote, I was out of the state of Delaware, where I vote, when my family had an emergency. I called and tried every which way to see how we could cast our vote. It was not to be. Today, I am so ready….I cannot wait to vote. No hell or high water would keep me away from this one!! Happy National Coffee Day! Get your caffeine and celebrate!! Our favorite coffee shops are offering deals throughout the day; McDonalds, Dunkin’ Donuts, 7-Eleven, Krispy Kreme among the most popular. 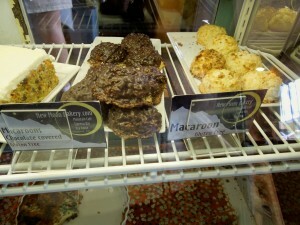 If I had my choice I would go to the New Moon Bakery. 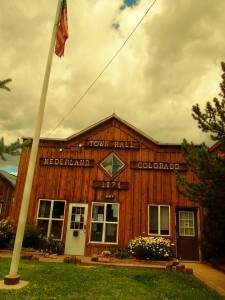 Unfortunately, that is not going to be the case, since it is located in the town of Nederland, Colorado, which dates to the 1800’s. I am at the Delaware Beaches…too far!! 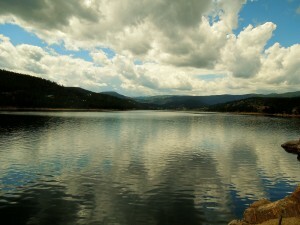 The town is located southwest of Boulder, near the Continental Divide and the Baker Meadow Reservoir. 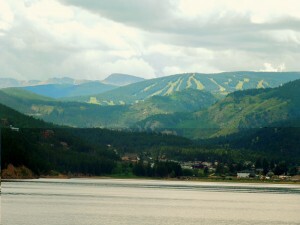 It is also the closest town to the ski resort; Eldora. When visiting Colorado in August with my friend, Cindi, we decided that this was the best coffee we had had in a long time. We ordered the Breve. Breve is short for Espresso Breve. It is espresso with 1/2 & 1/2. The coffee and boiled milk; poured at the same time into a cup. A rich and bold cup of coffee is what it is!! 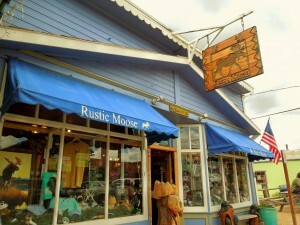 New Moon Bakery has been in Nederland since 2009, at 1 West 1st Street. Tel. 303-258-3569 Website? 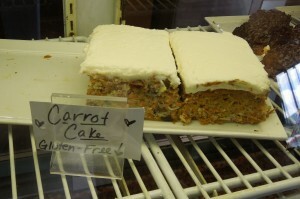 http://www.newmoonbakery.com. 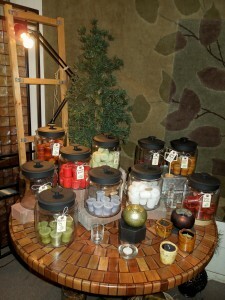 Besides being a coffee and espresso bar, it offers plenty more. A wide assortment of gluten free baked goods are on the menu. So…if you are visiting the city of Boulder, it will be worth it to stop in this quaint bakery where everything is homemade every day of the week. I am back at the Delaware Beaches, but I am remembering that last week I was getting ready for an experience; whitewater rafting. For all of you that go to Colorado on vacation, please keep this post in mind because the company we dealt with was very professional. 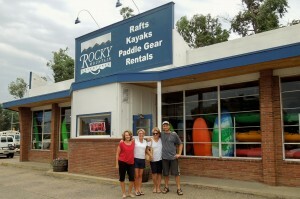 If you would like to experience the outdoors, Rocky Mountain Adventures is the company to call. It is a full service store. 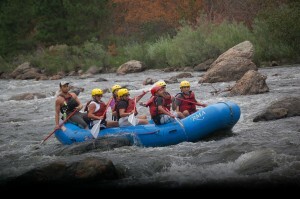 Trips are offered all through Colorado; even overnight trips. 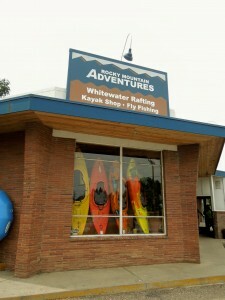 Rocky Mountain Adventures is located at 1117 N. Highway 287, Fort Collins, CO 80522. Tel. 800-858-6808 or 303-493-4005. Website? http://www.shoprma.com. 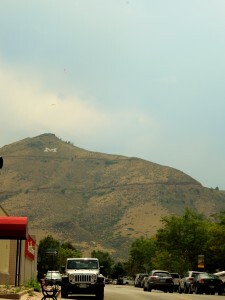 We were driving to Fort Collins from Golden where my friend, Cindi, and I were staying with my longtime friend, Marisa and her husband, Dave, on Lookout Mountain. I think the trip took about 2 hours. I had no idea what to expect. Ignorance is bliss, at times. 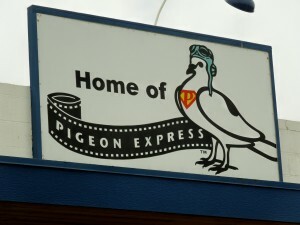 The first thing I noticed on the building was a sign that said Home of Pigeon Express. I figured it was a name for a FeDex office or delivery business. 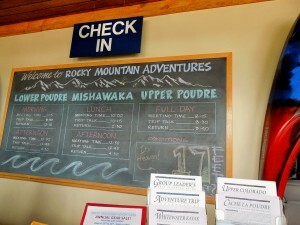 Put it out of my mind since we needed to check in with Rocky Mountain Express. 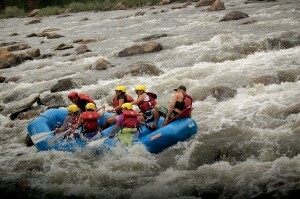 It seemed there were about 23 people that were going to be divided into 4 rafts, for an afternoon of whitewater rafting. Instructions were to be given, but first you needed to have proper shoes. My friend, Cindi, decided to rent one of their booties. 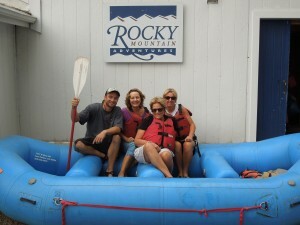 Then, a meeting outside to go over all the precautions, warnings, proper use of life jacket, paddles, etc. etc. 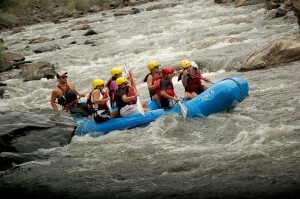 All I kept thinking was that I did not want to turn over and be under the raft. From the corner of my eye, I saw a real pigeon. I said to Cindi; remind me to take a picture or to find out what the heck is going on with the pigeons. Nobody said anything about them. 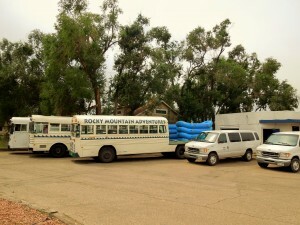 Off we went on buses with the self bailing rafts in the back. It took some time to get to where we were going to start our adventure. 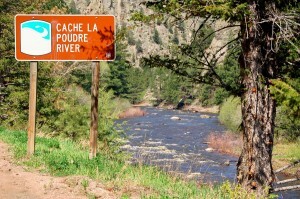 The Cache la Poudre River is Colorado’s first and only designated National Wild and Scenic River. 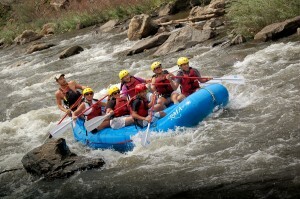 The rafting takes place in a pristine and protected environment. On this particular trip, we saw the damage done by the fires a few months ago. The river had ash in it. The trout is just coming back. I wish I had had my camera to take the first pictures of our guide, Adam. You should have seen his face. It said it all; it was going to be a challenging day. 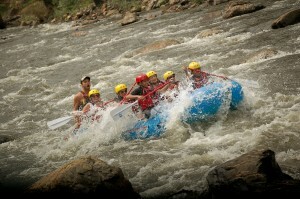 And, I am sure he was not thinking about the rapids. We were novices, what can I say? Some said they had done this or that but we were beginners in all of this. 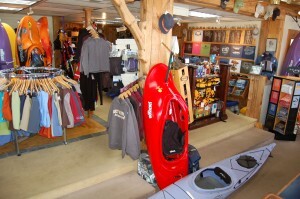 After definite instruction in paddling, etc. etc. 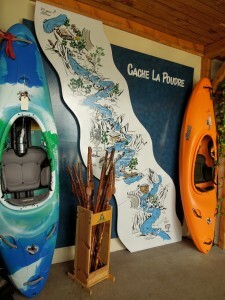 I remembered how to paddle, I went to summer camps and canoed till I dropped more than a few years ago. 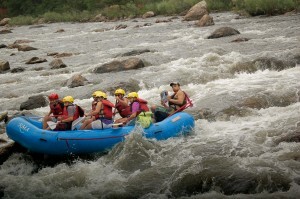 Anyway, off we went down the river with Adam. Even though he had no confidence in us at the beginning, I decided to follow his lead and do whatever he told me to do; we all felt the same way. Survival? You got it! Adam was an awesome guide. He shouted directions, relaxed, shouted again and we did it. I think he was surprised and proud too. We did excel, and became quite a crew. Adam was also very good in explaining the vegetation, the trees and had plenty of information on the damage done by the fires. He was also pretty funny, taking the magazine out as pictures were taken. Then, he was all business again. It was exhilarating, beautiful, and peaceful at the same time. There were some crazy moments, but we survived them. When we reached our destination, Adam, proceeded to tell us that he wanted us to experience what we had just gone through. 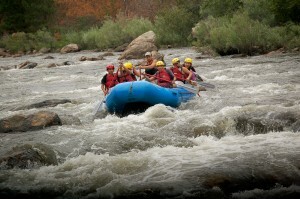 We were to float with the rapids on our back. Is that so, I thought? Okay, we were already so wet, anyway. There was a hesitation, just a bit, then, we followed him. 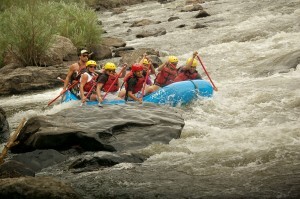 The current took us down the river floating; then, we kicked and got to the side of the river. 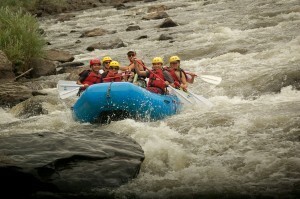 All soaking wet and the only guide that asked its crew to do this. Adam and the other guides were very friendly and love the outdoors. Adam Alter is from San Diego. He also is a snowboarding instructor. I will let you know where he will be this winter in case you need someone like him. On the ride back we had watermelon, and chatted with everyone. We all had a great time. We wanted to have pictures taken with Adam, so here he is with us. I had to laugh because as we were going down the rapids; so wet, I remember my friend Marisa telling me to take my camera……when was I supposed to be taking pictures? 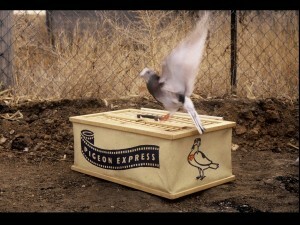 And….what is the Pigeon Express? I thought he was kidding. I asked Adam, what is going on with the pigeons next door? 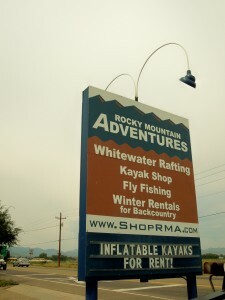 The pigeons work for Rocky Mountain Adventures!! 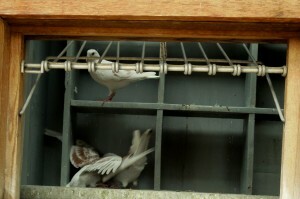 This is a photography program using homing pigeons. 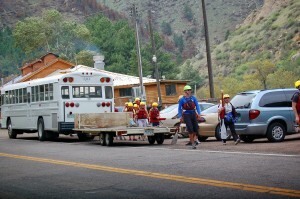 Using Lycra backpacks, the pigeons fly the film of the rafting tours, on the Cache La Poudre River, back to their outpost in Fort Collins. They usually travel 20 to 40 miles. 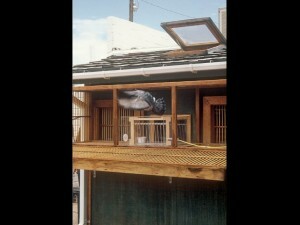 When the pigeons are released in the Poudre Canyon, they “home” in on their loft and fly back in about 20 minutes. That’s why the pictures on the river are ready when you get back. 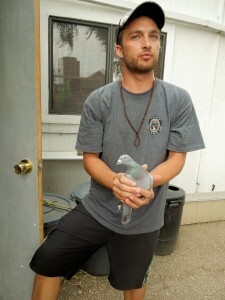 The pigeons are reliable; fun and really hard workers. 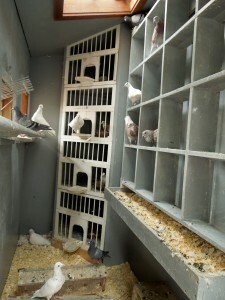 They have been raised by the staff, are friendly and like to be close to home. Isn’t that incredible? Here is Adam holding one of them. And, here is their loft. 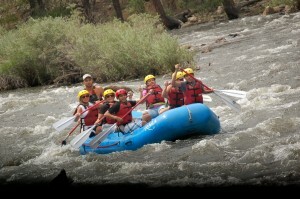 Thanks, Adam….it was so much fun…the rafting, the pigeons, and most of all…meeting you!! It was time to say “until next time” to Colorado. 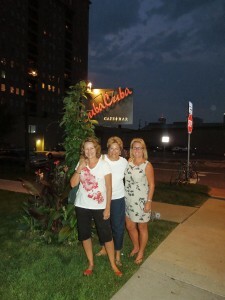 After coming down from Rocky Mountain National Park, we decided to stop by Cuba Cuba and have our last dinner in Downtown Denver. 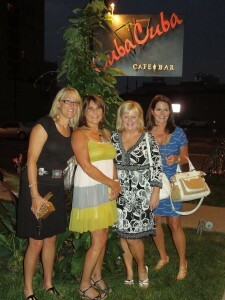 My friend, Marisa, knows the owner and she said that it was the best Latin restaurant with awesome Mojitos in Denver. 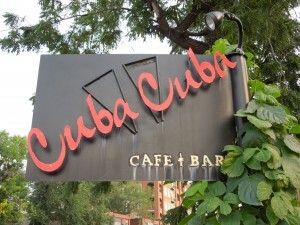 Cuba Cuba is located at 1173 Delaware St., Denver, CO 80204. Tel. 303-605-2822. Website? 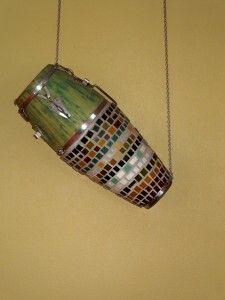 http://www.cubacubacafe.com. 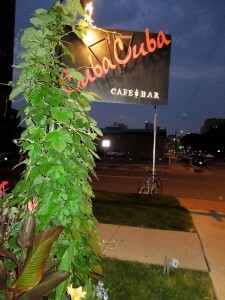 When I saw that Cuba Cuba was located on Delaware St., I started to smile. Delaware is where I live. The restaurant is in 2 historic homes. 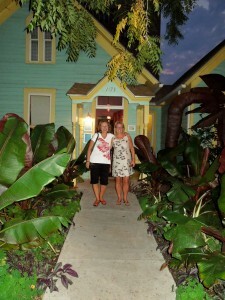 So quaint and very tropical. The walls show their Latin style. The Bar is popular. Cuba Cuba has an extensive offering of Rums. They also have Rum Flights. Martinis like the Cafe con Leche Martini and the Cafetini are also on the drink menu. 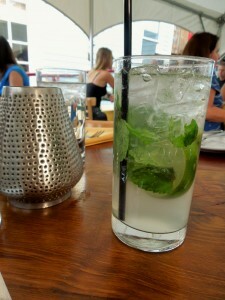 Mojito Happy Hour is Monday – Thursday from 5 p.m. until 6:15 p.m. My friends, Cindi and Marisa, decided to start with one of those Mojitos. They both agreed that they were delicious. 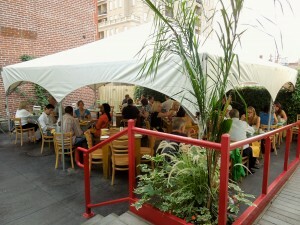 We were seated in their outdoor patio, which was shielded by a canopy. Perfect for dinner on a summer Colorado evening. There is indoor dining available, as well. 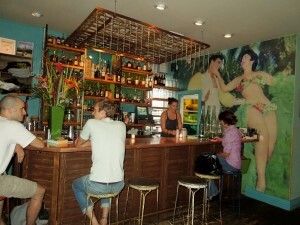 A few tables are also set up at the bar. 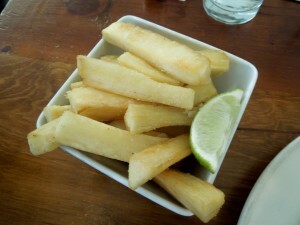 Yuca Frita, which were hand cut cassava fries tossed in garlic mojo. Yuca is a root vegetable. It is starchy so you have to be careful how too cook it so it does not become too dry. I found this particular one a little to dry for my taste. I could not find the garlic mojo in them. Mariquitas Cubanas. 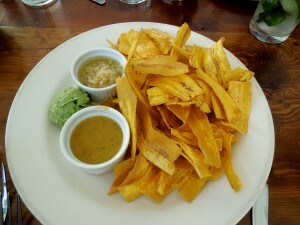 These were plantain chips with avocado mash and house mojos (garlic, mango/citrus). They were good and the mojos were delicious. I borrowed some of their mojos for the Yuca Frita. My friend Marisa loves Ropa Vieja. She kept calling it Ropa Sucia. Too funny. She had had this entree at Cuba Cuba plenty of times so she was confident it was going to be sooooo good. 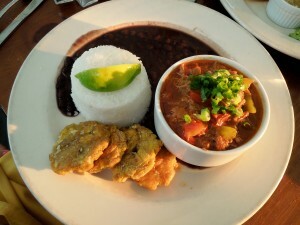 The Ropa Vieja had shredded beef sauteed in tomato creole sauce, served with white rice, black beans and tostones. You could tell Marisa did not like it. First she likes her Ropa Vieja with ground beef. Secondly, she usually has had it served over the rice, and the tostones were too thick. I took a taste of the Ropa Vieja; not much flavor. Latin food is one of the most flavorful; definitely there was a lot missing. It looked good but it left her disappointed. I decided to order the Paella with calamari, mussels, mahi mahi and chicken. It also had Spanish chorizo. 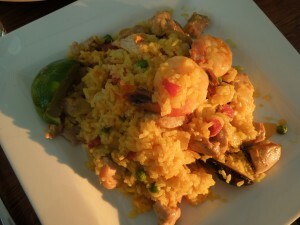 It was prepared with sofrito, saffron and Valencia rice. Bland and more bland. More saffron was needed, garlic, and possibly more sofrito. Paellas are also full of flavor. Sorry to say, this was, definitely, lacking flavor. You could have called this dish seafood, chicken and rice. But, not a paella. When my friend was asked by our server how the dinner was, she decided to tell her. I chose not to say anything. I was enjoying my dinner with friends and that’s all I cared about. Our server mentioned that there was a new chef. She also wanted to hear the comments. Cindi, was totally happy with her Camarones al Coco. 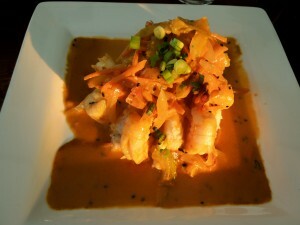 They were pan seared shrimp, sauteed with garlic, tomatoes, ginger, coconut milk and peppers, served over a potato mash. 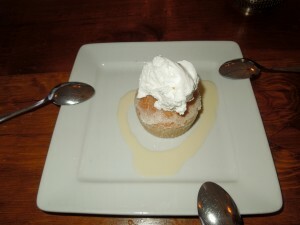 For our sweet ending we ordered a Tres Leches to share. This dessert was excellent. Tres Leches is a cake, filling and topping, using 3 milks; whole milk, condensed milk and evaporated milk. 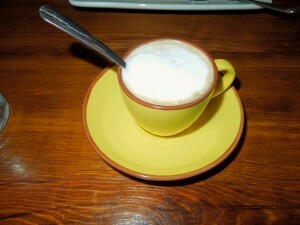 A decaf espresso, was the perfect ending to our meal. 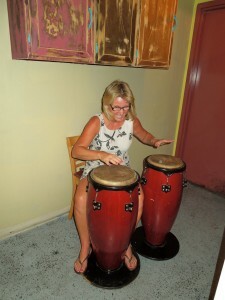 After some time, and with the help of those mojitos……one might try to play bongos. It was time to go home and pack; but not before we took pictures of others we met who were enjoying an evening with friends, as well. Then, they took our pictures too. That’s what you do when on vacation…. Note: Cuba Cuba offers catering and has plenty of space for private parties.